The Republic of Mozambique celebrates its Independence Day on June 25. On this day in 1975, the country gained its independence from Portugal. The first Europeans to set foot in the region were the Portuguese in the late 15th century. It happened during Vasco da Gama’s voyage around the Cape of Good Hope in 1498. Portuguese trading posts started to appear in the area from about 1500, displacing the Arabic commercial and military hegemony. In the early 16th century, the Portuguese gained control over the small Island of Mozambique and started to set up trading posts and garrisons in the interior regions, gradually expanding their influence. Eventually, the colony was named Mozambique after the island that had served as its starting point. At the end of the 19th century, Portugal shifted the administration of large portions of Mozambique to three chartered private companies: the Mozambique Company, the Zambezi Company, and the Niassa Company. The main purpose of the shift was to exert effective control of the territory, which Portugal lacked the capital to do. The companies improved Mozambique’s infrastructure, but they also enacted a forced labor policy and supplied South Africa and nearby British colonies with cheap African workforce. Following the establishment of the Second Republic of Portugal in 1933, the Estado Novo regime did not renew the companies’ concessions when they ran out, partly because of their unsatisfactory performance, and partly due to the new doctrine that saw Portuguese colonies as extensions of the metropole. As the world’s colonial system began to collapse after the Second World War, an independence movement emerged in Mozambique. 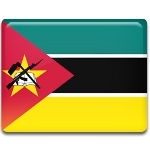 In 1962, several anti-colonial political groups founded the Mozambique Liberation Front (FRELIMO) to fight for independence. In September 1964, FRELIMO enlisted support from the Soviet Union and initiated a guerrilla campaign against the Portuguese administration. What began as an insurgency grew into a full-scale independence war that lasted for over a decade. Although the Portuguese regular army was more numerous and better equipped, FRELIMO had the support of communist and socialist regimes. Eventually, Portugal lost the Mozambican War of Independence because of its own political instability. In the 1974 Carnation Revolution, Portugal’s Estado Novo regime was replaced by the leftist National Salvation Junta. The new government called for a ceasefire and entered negotiations with FRELIMO. On September 7, 1974, the Portuguese government and FRELIMO signed the Lusaka Accord that recognized Mozambique’s right for independence. The independence was formally proclaimed on June 25, 1975. Independence Day is one of the several public holidays commemorating Mozambique’s independence struggle. It is a national holiday and an official day off for government employees. The highlight of the official celebration is a large military parade in the country’s capital of Maputo. It is attended by the president, who delivers a celebratory speech, and other officials. Smaller local events are held in cities and towns throughout the country.